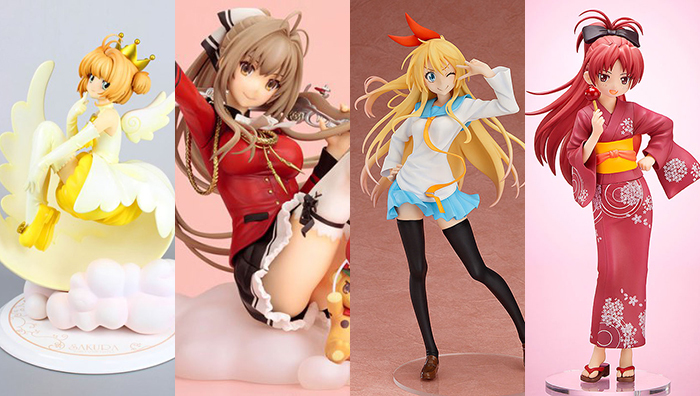 Hello, and welcome to All Your Monies, where The Glorio Blog’s resident toy and figure collecting crew (with Iro and Marlin) will run down the last week’s new pre-orders, turning a loving or scathing eye over what’s been put out for you to spend your hard earned cash on. This week, Alter bring their A-game but even they can’t stack up when Bandai decides to DROP THE HAMMER. .
Zigg: The moment Bandai revealed that the Goldion Hammer would not be included with Soul of Chogokin GaoGaiGar I think we all knew it would come later as an expensive accessory. I don’t think anyone was prepared for something like this though. 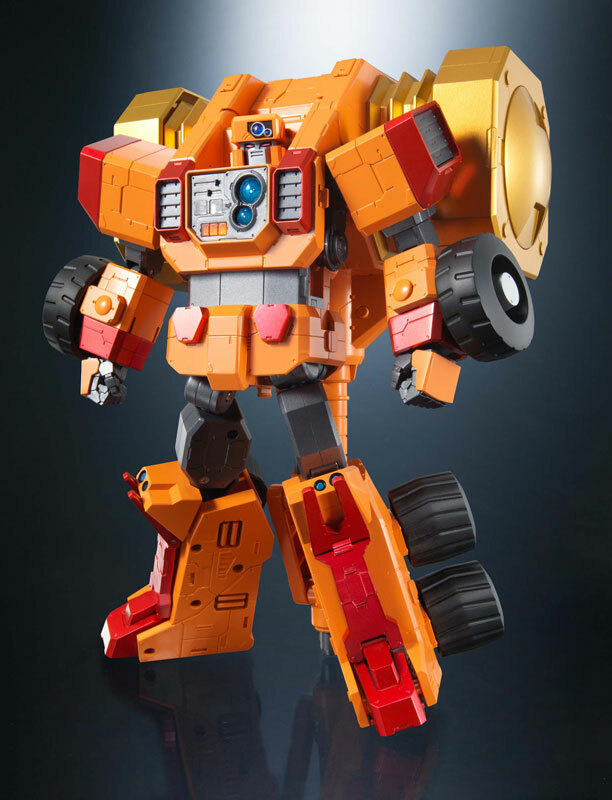 Goldymarg here isn’t jsut an add-on, he’s a fully fledged SoC in his own right, with a scale and a price to match. I’m at once impressed by the effort and repulsed by the cynicism of the marketing ploy. I still ordered one though. Jel: I’m sorry I’m not even making a joke here, that is definitely a transformer. Surely there were some kind of legal ramifications for making this thing, right? It does look very well made as I would expect from the Chogokin line, but seeing as I have no knowledge of GaoGaiGar I’ll leave the more in-depth analysis to my colleagues. Iro: Apparently this is fully functional and turns into the Goldion Hammer, Goldy Tank, and Marg Hand. If you’re already dropping the cash on that ridiculous Soul of Chogokin GaoGaiGar figure, might as well get this one to complete the set. It’s already too late for you Zigg, I’m sorry. Marlin: Well, that is certainly a giant hammer robot. I’ll get to GGG one of these days, and stuff like this definitely seems to prove this show’s dedication to silly fun. If it can really transform in every way Iro’s described, then it’s a pretty sweet robot, but that’s still a 150 dollar robot. Zigg: No ifs, no buts – I really, really like this. The pose is incredibly full of life and energy and I love the weird clashing mix of pastel colours. 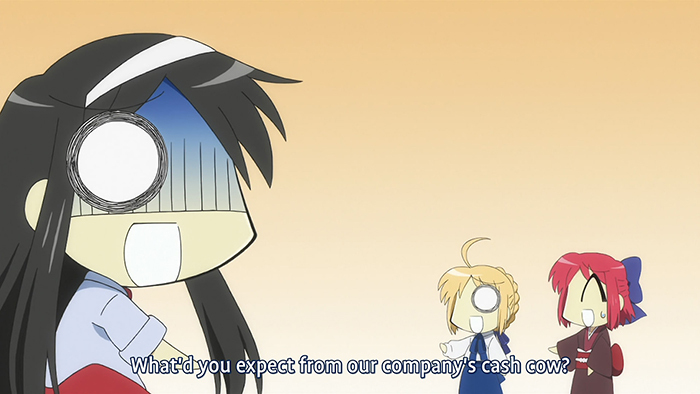 They’ve also pulled off the rare-for-anime feat of making a character look attractive without overly sexualising her. Then there’s that undoubted Alter quality to contend with. This is the first figure we’ve featured on AYM is quite a while that I would unconditionally like to have despite no familiarity with the source material. That’s high praise indeed. 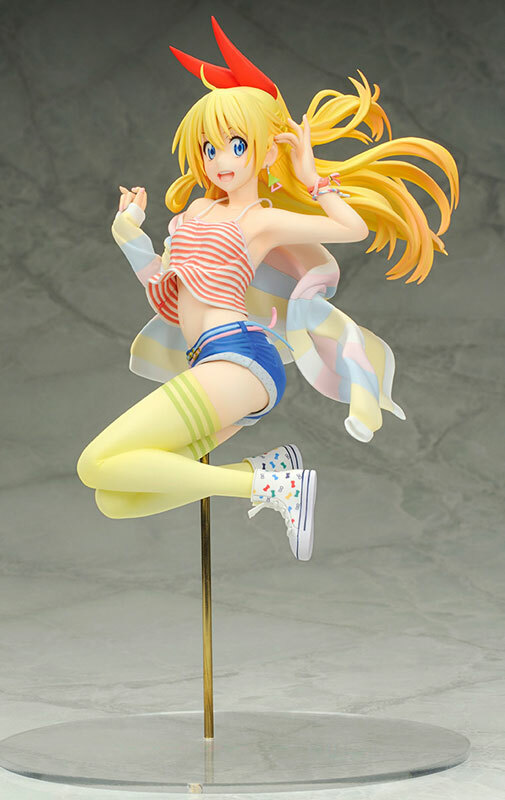 Jel: I like Chitoge’s design and I think it’s a rare example of a character that they could have made an interesting school uniform figure out of. So Alter gets a huge amount of bonus points for making an incredibly vibrant, energetic rendition when they could have easily phoned it in. Her outfit is a glorious clash of colors that somehow come together and demand your attention. Her pose and expression are super fun and help cancel out the fact that you can see halfway up her shirt. Add in Alter’s awesome sculpting and the hope they will improve the base and we have a winner here. Iro: So when are we getting Double Arts figures? Marlin: It’s kind of amazing how much skin this figure shows compared to how skeevy it feels. The freeze frame moment makes all the exposed midriff actually make sense, and her face is as energetic as her motions. There are some weird bits to this piece, though. Why does she have her arm through one sleeve of that jacket but not the other, and why is she using that left hand to fix her hair when she’s gonna have to fix it again when she lands anyway? Kinda just seems like it’s there to show off that earring since otherwise it’d be covered by her hair. Zigg: I’m not a fan of the shinobu character, but this is a fine looking figure of her. As ever, Alter are supremely on point with the cloth on her flapping dress, while the Shaft pose is a neat touch, as is the adorable donut. The base is tops too – I love it when companies put a little more imagination into this very important part of the figure. Fans will be thrilled, but as it is I’m impressed but not enraptured. Jel: I feel like this has been in production forever. Maybe I’m getting it confused with another figure? Either way, now that it’s here Shinobu looks pretty adorable. I love the details like the texture on her hat, the faux labels on her shoes, and that donut that might be the most realistic looking food item I’ve seen on an anime figure. My only very minor complaint is the long part of hair looks a little chunky, but that’s just nitpicking. 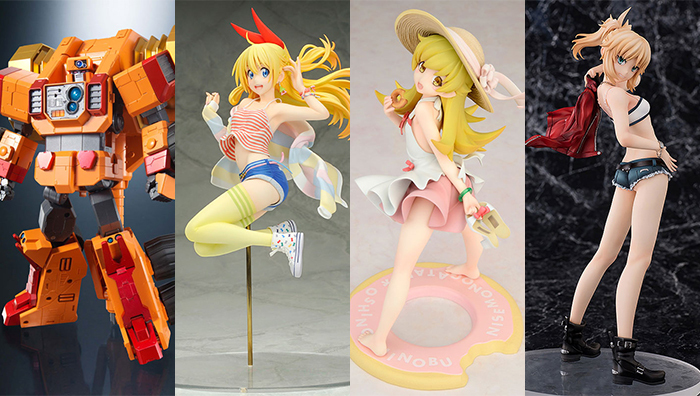 it’s a nice looking figure that should fit well in your now potentially huge Monogatari collection. Marlin: I like Shinobu as a character, she usually ends up on the right side of “really hundreds of years old loli”, but I could never fathom any reason for owning a figure of her. Just seems like you’re asking for some very awkward questions. Still from a technical standpoint it does look really well made, that hat might be worth the price alone. Give me a long hair Kanbaru with that kind of detail and then maybe we’d be talking. Zigg: I’ve seen so many Sabers at this point that it’s difficult to get worked up too much for another. The pose is great and I like the coat over the shoulder, but she’s not really wearing enough to do anything too crazy with the rest of her. Nice boots though. Iro: I’m sick of Type-Moon’s ridiculous merchandise machine churning out stuff like this (for reference, this is a character from a spin-off light novel that was based on a cancelled MMO spinoff [which is now being recycled into a mobile game spinoff], whose character design is based off a cameo in the DEEEEEEEEN anime), but I’ve come to realize this is what lets the actual show have so much goddamn money to burn. As such, I feel like I’m not allowed to complain. Marlin: I guess it’s daisy dukes week now? The worst thing about skimpy character designs is that it doesn’t leave you a lot to work with. Plus, it may look pretty detailed but there’s certain parts that are pretty lacking. Since her daisy dukes are cut so short they go through the pocket, there should be some extra layers in the frayed portion there, but it just looks like someone put santa hat stuffing around the edge and called it a day. Beyond that, the face just looks plain off, is she smiling? Grimacing? Basically looks like she’s wearing a mouthguard or something. 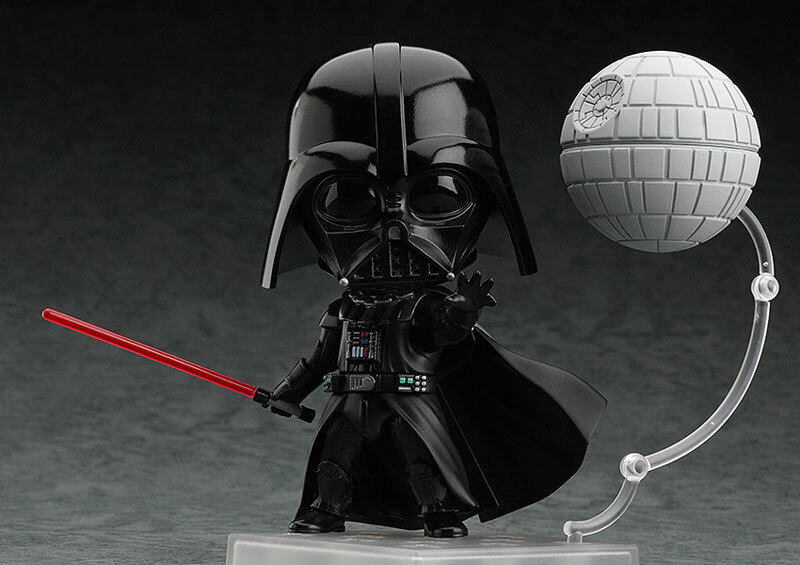 Jel: We now have a nendoroid Death Star. I love this crazy world we live in. Iro: The power to destroy planets is insignificant compared to the size of his head. Marlin: The Death Star is a nice touch, but the actual Vader himself just looks off. Since it’s just a helmet there’s really nothing to chibify and thus he basically comes off as looking like Lord Dark Helmet.